What a charming book and I have no question to doubt it reaching the bestseller lists. A book on punctuation, just in time. 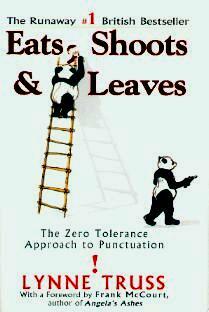 Author Lynne Truss is humorously preoccupied with the use, and misuse, of the apostrophe. It seems as though so many have forgotten (conveniently, or never schooled properly?) how to use it, and her pet gripe is the incorrect use of "its" and "it's". Written in British English and full of British examples of misused punctuation, Ms. Truss really had me giggling. Not only the apostrophe but also the dear old comma and others. I am guilty of misusing the comma now and then, just because it reads better where I decide to put it. Nowadays, and I've seen it myself so often, people have little or no idea about how to use an apostrophe, which irks me no end. I was so relieved to learn about other sticklers getting upset when they come across similar errors. I hope that English teachers around the world get to read this gem of a book. What they find therein must be passed on or else writing, any little bit of scrawl (a simple thank-you note or a shopping list), will make us look like illiterates. (For fun, scrounge around on the Internet - amazon.com for example - and look for book reviews by readers. You won't believe how badly written some of them are. Other places to look at are some of the job markets. Some of the job descriptions call for editors or editorial staff, leave a lot to the imagination.) We're all guilty, even publishers! Truss covers semi colons, colons, dashes, and hyphens as well. Wonderfully humorous quotes from the likes of Virginia Woolf, George Bernard Shaw, the Bible, and many more. Most amusing. Grammatically we're sinking and this is our lifeboat.